Hyper Japan's Christmas show was a resounding success , part of that success I put down to some quality acts on stage which appealed to a vast array of people. Now for a site like K.I.T.G. The act that got our attention was of course the appearance of Kamui Sword-masters which is headed by Tetsuro Shimaguchi. Tetsuro and his team travel the world putting on shows and are in high demand , A lot of this is down to their film work where they choreograph fight scenes for TV and film. In the West they are known for the Sword play in Kill Bill , Tetsuro actually played a small role as Miki ,one of Lucy Liu's henchmen and a member of the crazy 88's. Now another cause for Kamui's demand is their workshops ,where they teach others on sword play and looking good on stage but without losing that Martial element. As well as three great stage shows at Hyper Japan Christmas 2012 ,of which we where privy to two of they also took nine workshops ,where the not faint of heart could indulge in learning some sword play and then perform in front of a Audience. Of course for myself this was not something to pass up and I took the challenge by enrolling for the last class at Hyper Japan. I had watched quite a few of the previous ones over the three days and as I had some knowledge of Japanese swordplay through my Kobudo classes I new it would be quite easy for me . But what you don't realise is after being at the show for three days is how tired you get ,especially being press which means a lot of crouching on the floor by the stage taking photo's ,up and down like a yoyo. With nearly a hour tutorial by Tetsuro and his team which partner each of you in turn. I did find some participants having trouble as if you have never done any formal martial arts training before it can be quite a shock to the system. 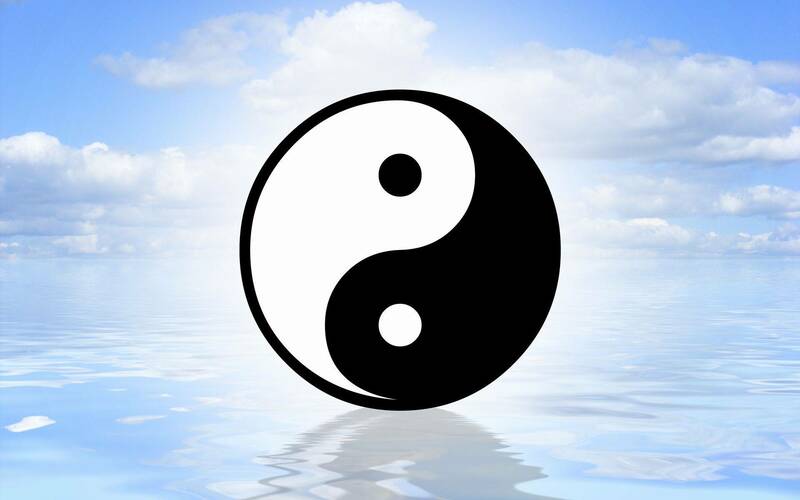 Even people that think there fit ,even people that frequent a gym regularly can have a problem ,in fact as a Martial artist I have been present when Gym instructors have attended classes and more or less collapsed never to return. Yes martial arts is about much the mind as the physical element and one thing to get over is the feeling of being tired ,you must learn to fight through it and soldier on ,because once past that point your be surprised what one can achieve. Anyway so after a very regimented instruction in sword arts it is the turn of the participants to go through a small routine with one of the team , and all in front of a audience at Hyper Japan .ahhhh! In fact as that moment approaches all the tiredness you might have felt through doing the class has gone as the only thing you think about is not messing up in front of four hundred or so watching people. I took a lot of pictures and video of the various classes at Hyper Japan and this is dedicated to those participants who took part ,i hope you enjoy the pictures ,though I may have not got everybody. Also here is a few extra shots of Kamui performing their stage shows at Hyper Japan and a video to. For us at K.I.T.G. 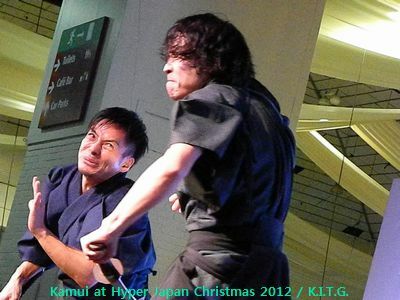 This was a rare moment to not only see Kamui on stage but also train with them and for that it makes Hyper Japan Christmas 2012 rather special. A selection of stills from the Workshops , even a couple when the lights went out at Earls Court and Kamui carried on teaching in the dark. 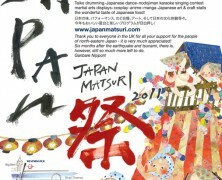 Don't forget to visit the other pages on Hyper Japan 2012 Christmas on site and on our dedicated Cosplay site. Hyper Japan Christmas Feature on K.I.T.G.